If you think Hong Kong is just a glamorous concrete jungle with only fancy bars and malls, you are dead wrong. The natural wonders in Hong Kong are just as fascinating which is why this city is so dynamic! We have gathered some of the most exciting wild destinations in Hong Kong for you among the hundreds more. Go outdoor and explore! Located at an altitude of approximately 600 meters, Kowloon Peak is the highest mountain in the Kowloon area. Spectacular view of the Kowloon Peninsula can be viewed from everywhere on the summit. The South Ridge facing Choi Wan is dangerously steep with slopes and stone walls. At the top of South Ridge there lies the famous “Suicide Cliff” popular for photography and adventure. The existence of such wholly natural infinity pool in Hong Kong simply blows my mind. Located in Tai O, you could chill in this naturally stunning infinity pool without pay a single penny but only a 45-minutes hike! What more could you ask for? 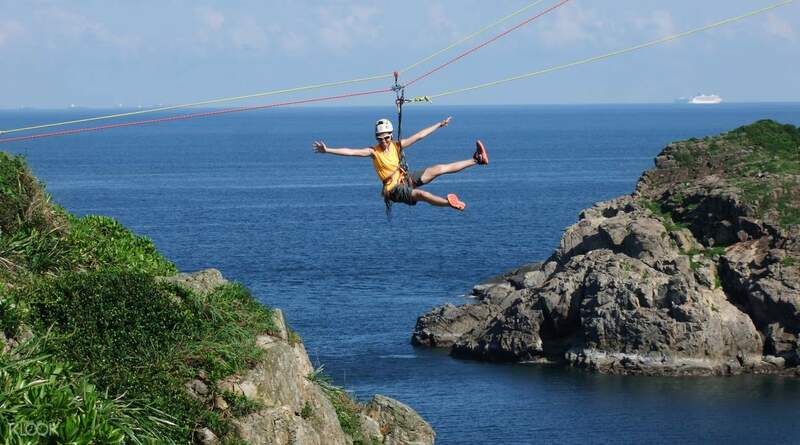 Ziplining is not the privilege of South East Asian Countries, you can actually do it right here in the city! And yes, we have probably got the best view for ziplining. I mean, where else could offer you the view of ocean, cliff, mountains, and highrise skyline all mixed? The spectacular Silver Mine Waterfall is surprisingly easily accessible, the series of waterfalls begin less than 2km from Mui Wo Pier. Walking past the beach, village houses, fields and woodland comes the three sets of falls, the Silvermine lower falls, Pearl falls and Silvermine main falls. The falls are heavily dependent on rain flow, so it’s best to visit during the wet season, or even right after the tropical heavy rain in Hong Kong! For those who like to add that spooky spice to you mini adventure, Bride’s Pool, which is named after a ghost story about a bride who fell out of her bridal sedan chair and was drowned in this stream, is where you should go next. The psychic myth, however, does not prevent the local nature-lovers from visiting. The pretty 70-foot-high falls with crystal clear water makes it a very popular place for swimmers especially during the hot summer season. Besides, Tai Mei Tuk barbecue area is only 15-minute walk away! What’s better than jumping into a natural pool after a hot summer barbecue?! Tip: Never go after rain – it’s very dangerous, even for the experienced! 7. Walking On Water To Tombolo Islands, No Ferries Needed! Tombolo is the is the natural narrow piece of “sand bridge” formed that connects the mainland to an island. Hence you could literally walk on the water though that sand bridge. How cool does that sound? And if you didn’t know, Hong Kong has indeed a lot of tombolo islands that you could walk to instead of taking the ferry! Yet a lot of them are far and are hard to reach. The three tombolos that are introduced below are relatively easy to be accessed and possess a stunning view of mother nature. An easily reachable oasis with an absolute tranquil environment and impressive view of the blue water, and yet, not a lot of people talk about it! A simple circular walk of about 40 minutes to disconnect from the world for a while easily! How to get there: Catch the MTR Nam Cheong Station (Tung Chung Line), then transfer to the west rail line (the pink line) to Kam Sheung Road station. Get out of exit D and hop on the green minibus No.71 all the way to the terminal station (Shek Wu Tong, Ho Pui ). Simply start walking following the HKFYG Organic Farm signs as and you will see the entrance sign of Ho Pui Reservoir Family Walk sign after walking around 25 minutes. Previous ArticleMediterranean Sunset Tuesday at Sugar: Cocktails With FREE Pizza!